I had been invited to make some carvings for Gwalia farm near Machynlleth in North Wales, in return for a stay there at their stunning 'Cabin by the Lake'. This beautiful spot has a private lake, canoe and wood-fired hot tub. Luckily, an oak tree on the farm had just dropped a large branch and so there was plenty of timber to carve! I really liked the drum idea and showed a few people when back in Bristol. Jono at Touchwood Play realised that the drum stools would work very well in a new project that they were working on. After making a couple more examples to refine the idea, I was commissioned to make six of the stools. First there was a trip out to Backwell, near Bristol, to look at the oak timber available. It had to be of a certain diameter to make a good stool. 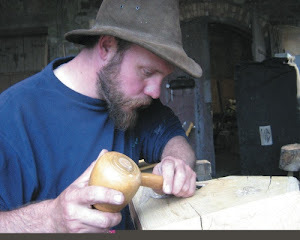 Once the logs were back at my workshop, the hard work began! Firstly, the logs were cut to size, the bark removed using a mallet and chisel and then the stools were smoothed to remove tool marks. I used a chainsaw to cut the bars into the logs. The bars then needed to be sanded and cleaned up, which took a lot of time. Once that had been done, I carved two rows of ridges onto each stool, to make an effect a little bit similar to an instrument called a 'guiro'. The drums still needed sticks to play them with. These were turned from locally-grown hornbeam timber. Hornbeam is a very tough wood, traditionally used to make butcher's chopping blocks and the teeth for large cogs, such as in mill workings. It was perfect for this job. 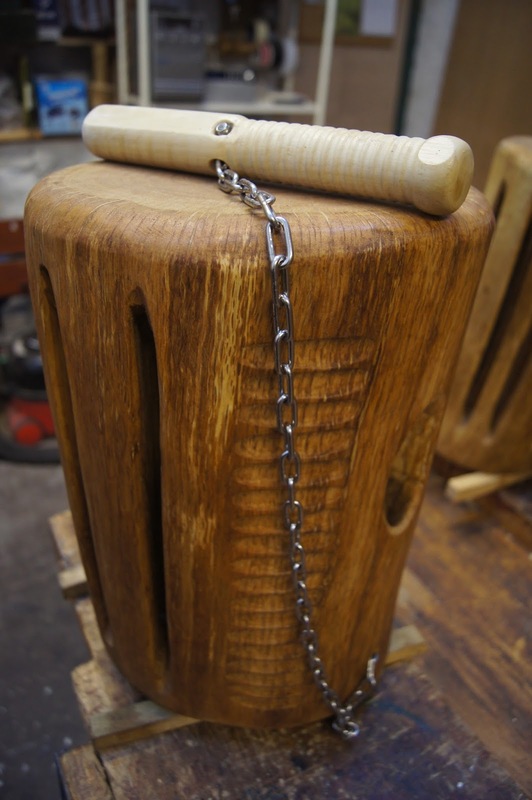 The sticks were chained onto the drums using good-quality stainless steel chain (as stainless steel doesn't react with and discolour oak, unlike normal iron or steel). There was also a hole drilled into each drum to hold the sticks when not in use. The chain is attached halfway along the stick to avoid it making a dangerous looping foot snare when stored in its holder. I'd like to refine the tuning methods on future drums, although the tuning on these drums will probably change a bit over time anyway, as the wood dries. I did notice that small cracks in the oak, formed during seasoning, didn't seem to affect the sound much at all. The drums will eventually be mounted in a circle onto a wooden platform in a play tower. They will be fixed down using large screws, so that they can't fall over or be thrown and injure anyone. To allow them to resonate and make a good sound, there will be rubber feet under each one. I've placed wooden sticks under them in these photos to allow a good resonance when playing them in the workshop.